The total resource for anyone looking to get hired by Big 4 Accounting Firms! 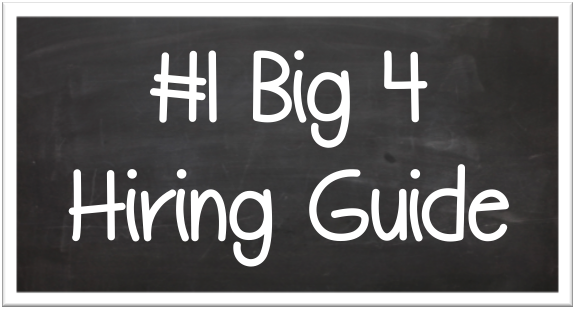 Big 4 Accounting Firm #1 Hiring Guide! Big 4 Accounting Firm 5 (MORE) Secrets to Hiring! First off, check out my blog for twice a week updates on everything related to Big 4 Accounting Firms. 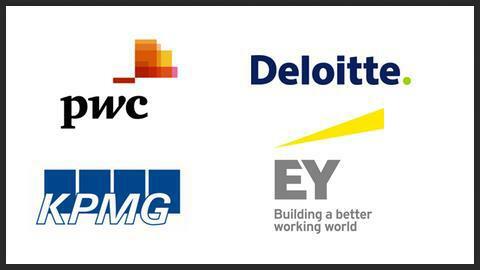 The Big 4 Accounting Firms are some of the largest and most respected professional services firms in the world. If you've found this page, you're well on your way to learning more, getting hired by, or succeeding in the Big 4 Accounting Firms. Each of the 4 firms has a slightly unique personality, but they have one thing in common, they are significantly larger than the 5th, 6th, and other smaller firms. The smaller Big 4 firm, is still multiple times the size of the other firms. These firms are international public accounting firms and they're represented by the logos at the top of this page: EY, PwC, Deloitte, and KPMG. By getting involved in Big4Guru.com, you're joining a very special group of people! The Big 4 Accounting Firms have some of the best and brightest employees in the world. If you've made it this far, you're fast on your way to joining them! The only think you'll have to figure out are whether you want audit or tax. Be sure to evaluate all the pros and cons. I am here to help you every step along the way. I started Big4Guru.com in 2008 with one goal in mind: Help as many people as possible work for the Big 4 accounting firms. 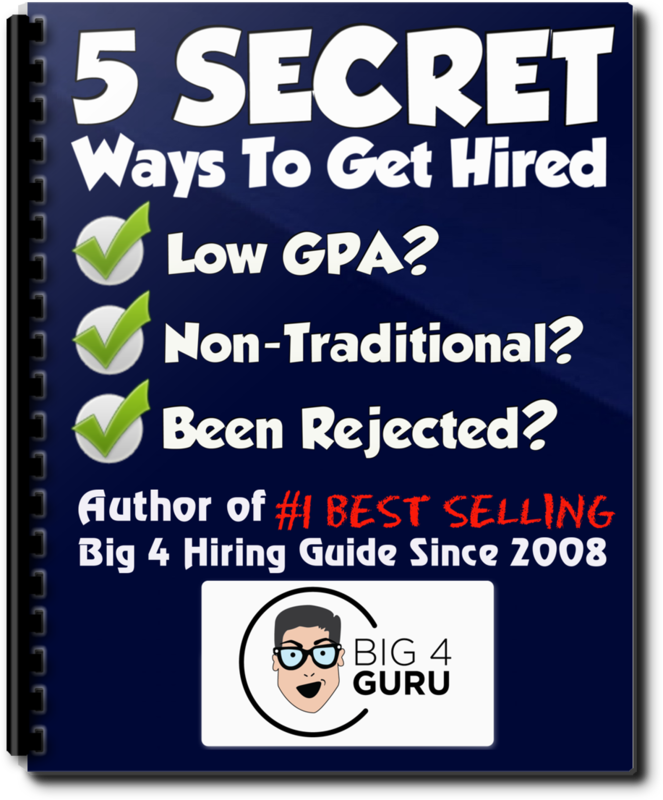 Now, 5+ years laters, thousands of people have been hired by the Big 4 and thousands have purchased our eBooks and used the resources available at Big4Guru.com! 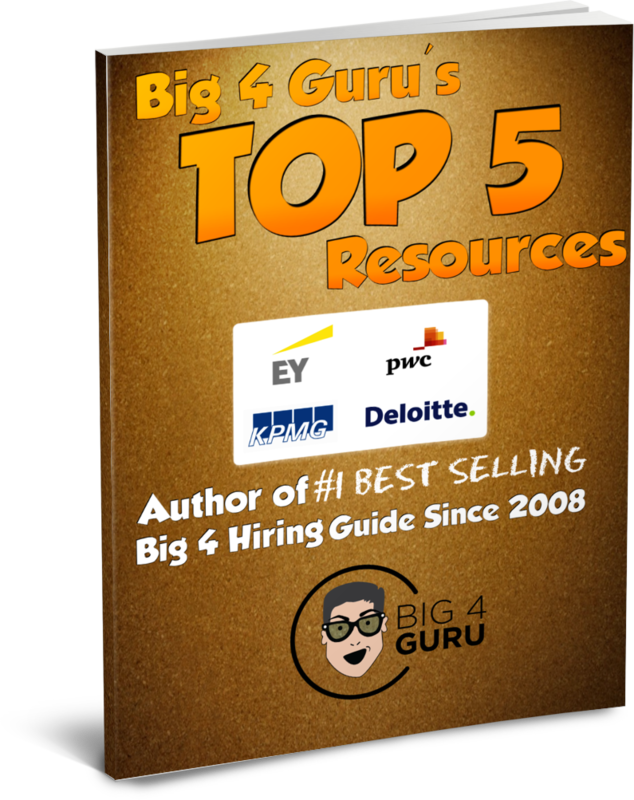 Speaking of resources, here is a link to your free list of Top 5 Resources for an aspiring Big 4 candidate or new hire ! Get Big 4 Accounting Firm Updates!